Zechariah (Zacharias in the King James Version of the Bible) was the father of John the Baptist. He was a Jewish priest of the line of Abijah during the reign of King Herod the Great at the turn of the common era. He was husband of Elizabeth, who was also of a priestly lineage. Their son, John the Baptist, became a famous preacher, identified in the New Testament as a prophet and primary forerunner of Jesus as the Messiah. According to Luke's gospel, Zechariah received a revelation from the angel Gabriel while ministering in the Temple of Jerusalem, telling him that Elizabeth, though well beyond the age of child-bearing, would bear him a son. He was struck dumb for not initially believing this prophecy. Elizabeth did conceive, and during her pregnancy, she and Zechariah offered hospitality to Elizabeth's cousin Mary. After three months in Zechariah's home, the visibly pregnant Mary returned to Nazareth. After the birth of John the Baptist, Zechariah was able to speak again, and he prophesied that John would "go on before the Lord to prepare the way for him." The biblical traditions about Zechariah are centered on the birth of John the Baptist; he plays no role in the Jesus story despite Mary's visit to their home. Hence, for most Christians he is a minor figure. A unique view is found in the teachings of the Unification Church, by which Zechariah was Jesus' father. Zechariah's death is not recorded in the New Testament, although an apocryphal tradition in the Infancy Gospel of James reports that he was murdered by agents of Herod the Great in the temple courtyard. Zechariah is identified in Luke's gospel as belonging to the division of Abijah, one of the priestly families assigned to temple ministry in 1 Chronicles 23-24. The evangelist states that both Zechariah and Elizabeth were righteous before God, strictly observing all of the traditional commandments and ordinances. Like several important couples in the Hebrew Bible, however, their marriage was childless. Elizabeth was barren and, like her husband, was advanced in years (Luke 1:5-7). Luke relates that during his clan's turn to serve in Jerusalem, Zechariah was chosen by lot "to go into the temple of the Lord and burn incense" (Luke 1:9). Priestly duties at the Temple in Jerusalem alternated between each of the families that had descended from those appointed by King David to minister there (1 Chronicles 23:1-19). While priests were routinely allowed in the inner courtyard of the temple, to enter the building was a rare privilege. The offering of incense was one of the most solemn parts of the daily worship. 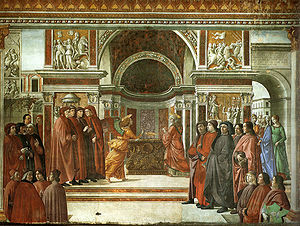 Some experts believe that, owing to the large number of eligible priests, no priest could hope to perform the task more than once during his lifetime. While Zechariah ministered at the golden altar of incense, an angel of God announced to him that his wife would give birth to a son, whom he was to name John, who would be a strict Nazirite from birth and would fulfill the mission of the prophet Elijah as the forerunner of the long-expected Messiah. He will be a joy and delight to you, and many will rejoice because of his birth, for he will be great in the sight of the Lord. He is never to take wine or other fermented drink, and he will be filled with the Holy Spirit even from birth. Many of the people of Israel will he bring back to the Lord their God. And he will go on before the Lord, in the spirit and power of Elijah, to turn the hearts of the fathers to their children and the disobedient to the wisdom of the righteous—to make ready a people prepared for the Lord (Luke 1:14-17). Citing their advanced age, Zechariah asked for a sign whereby he would know the truth of this prophecy. The angel identified himself as the Archangel Gabriel, sent specially by God to make this announcement. He declared that because of Zechariah's doubt, he would be struck dumb and "not able to speak until the day that these things happen." Consequently, when Zechariah went out to the waiting worshipers, he was unable to pronounce the customary blessing (Luke 1:18-22). 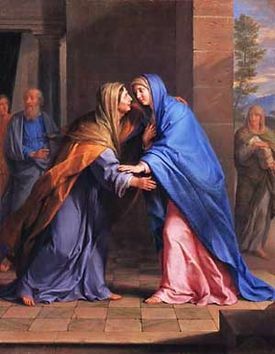 Zechariah's wife Elizabeth welcomes Mary. Zechariah returned home to the hill country of Judea, and Elizabeth indeed conceived a son. For five months she remained in seclusion, while Zechariah himself continued to be speechless. In the sixth month, Zechariah and Elizabeth received an unexpected visit from Mary, Elizabeth's cousin. The young woman, who was betrothed to Joseph of Nazareth, remained in Zechariah's home for three months. She then returned, pregnant, to her unsuspecting betrothed husband in Nazareth. even as he said to our fathers (Luke 1:49-53). Little is said about the relations among the three residents of Zechariah's house during this period. Zechariah confirms, "His name is John." because of the tender mercy of our God (Luke 1:60-79). The child grew up and "became strong in spirit," but nothing more is said of Zechariah. Now Herod sought for John… And Herod was wroth and said: "His son is to be king over Israel." …Zacharias [after refusing to divulge John's whereabouts] said: "I am a martyr of God if thou sheddest my blood: For my spirit the Lord shall receive, because thou sheddest innocent blood in the fore-court of the temple of the Lord." And about the dawning of the day Zacharias was slain. However, this tradition appears to be based on a misunderstanding of Jesus' reference in Matthew. "Zechariah son of Berekiah" is not John's father, but is identified in the Old Testament as none other than the author of the Book of Zechariah who lived during the fifth century B.C.E. (Zech. 1). To make matters more confusing, Matthew (or possibly Jesus himself) seems confused about the facts of the case of the prophet who was killed in the temple courtyard. 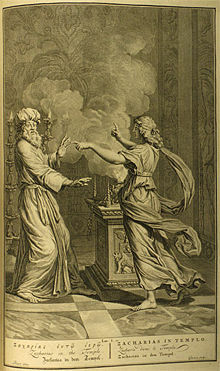 According to the Book of Chronicles, it was not Zechariah son of Berekiah that was killed there, but "Zechariah son of Jehoiada the priest" (2 Chronicles 24:20), who was "stoned to death in the courtyard of the Lord's temple" for opposing the king's tolerance of Asherah poles and idol worship. 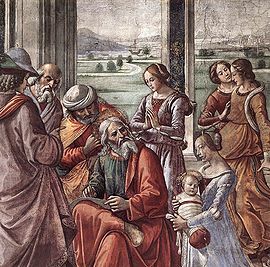 According to lesser known teachings of the Unification Church, which does not accept the virgin birth, Zechariah could have been the biological father of Jesus. The angel Gabriel directed Mary to Zechariah's house, and conveyed to her God's instructions regarding relations with Zechariah that would result in the birth of Christ, God's only begotten son. Zechariah, Elizabeth, and Mary subsequently should have protected Jesus, who could have grown up as a child of privilege in their priestly home. However, because circumstances forced Mary from Zechariah's house when she was three months pregnant, for an uncertain future with Joseph, Jesus was exposed to allegations that he was illegitimate. Their estrangement also created distance between Jesus and Elizabeth's son John the Baptist, which later would predispose John to doubt Jesus' ministry (Matt. 11:4-11). Zechariah is honored as a prophet and a saint in Roman Catholic, Eastern Orthodox, Lutheran, and other Christian traditions. Islam also accepts him as one of the prophets. Unification Tradition honors Zechariah's righteousness and initial faith, but affirms that he failed to fulfill his mission completely, to protect Jesus, and to foster unity between Jesus and John the Baptist. This page was last modified on 24 April 2014, at 19:52.